Fragment of a Frankish silver gilt brooch. 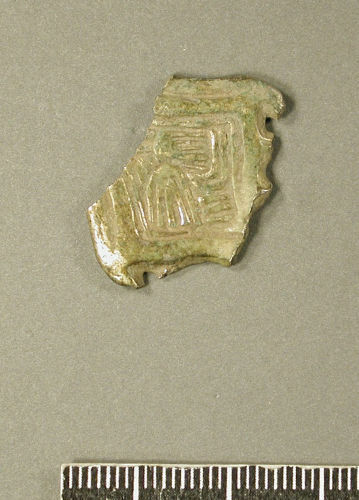 The fragment consists of the central, lozenge-shaped section of the foot-plate of a Frankish type of square-headed brooch. A plain border rib encloses the main panel of decoration, consisting of rounded, double-ridged chevrons on either side, and set at an angle to each other, with zones of ridges above and below, very similar to the decoration of a complete silver-gilt brooch from Trivières, Hainaut, Belgium. The latter belongs to Kühn's Rittersdorf type, which is distributed mainly in the Middle Rhineland, northern France and southern Belgium, as well as occasionally in southeastern England, indicating that the Northbourne find is a Frankish import into early Anglo-Saxon Kent (H. Kühn, 1974, Die Germanischen Bügelfibeln der Völkerwanderungszeit in Süddeutschland, Graz, pp. 1146-1161, pl. 312: 44, 27). But Kühn's dating of the type to the early 7th century AD is too late in most, if not all cases, and a 6th-century date is to be preferred. A fragment from the bow and top end of the foot-plate of the same type of brooch has also been found in Northbourne parish and reported as a potential Treasure find (ref. 2003 T297, KENT-D274F8). In view of the scarcity of this type of brooch in England it is conceivable that both finds are from the same brooch, although the possibility that it is from a second brooch of the same type should perhaps not be ruled out since the similarities of the metal analyses, which have been affected by corrosion, are not close enough to prove identity and the two pieces do not appear certainly to join. Surface metal analysis conducted at the British Museum indicated an approximate silver content for the brooch fragment of 85-90%; it weighs 4.63 grams and is mercury gilded on the front. Treasure case 2005 T351. Report by Barry Ager. Possibly part of KENT-D274F8, 2003 T297.